Anyway, it has been 3 weeks today since I started my starter. I was surprised by how easy it was to make it… you just need A LOT of patience (which I don’t have a lot of!) and not be afraid to experiment (which I am usually terrified to do because I HATE failures!). It was fun watching my starter slowly grow over the last two weeks. It took a while for it to take off because our home is so breezy and cool. I threw the starter in the dehydrator a few times and that seemed to help get it going on a steady pace of rising and showing life (LOTS of bubbles). I also didn’t worry too much about how much I was feeding it as long as I was feeding it! I found that some people like to weight their flour or at least measure it accurately when feeding their sourdough and baking. I am finding that I am pretty spontaneous when it comes to feeding my starter… sometimes I might throw a little extra flour in or give it less water or not feed it at all! Why? My guess is the feeling of just learning what its needs are and eyeballing it :o) If I don’t get a lot of action after its previous feeding… I just give it a stir and put it somewhere warmer, like my dehydrator. If I get lots of action… I scoop out only a 1/4 of the starter and give it extra flour/water. Most of the time is it pretty much the same… scoop out half and feed it 1/4 cup flour and water. Again, its all experimental and everyone’s sourdough is unique because no home environment is the same! PM- Started the sourdough starter with fresh hard white wheat flour and water. 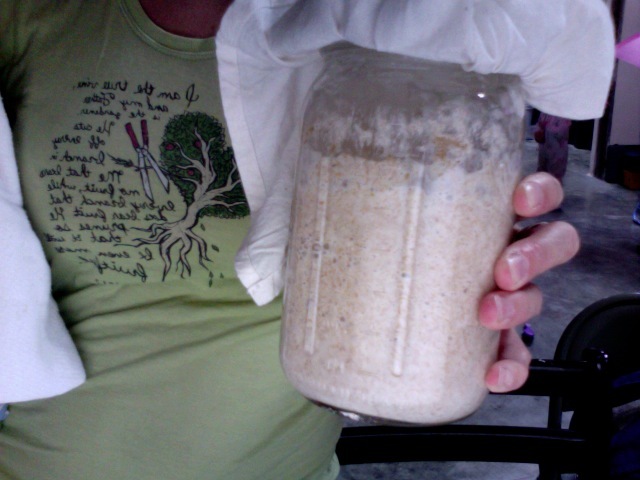 Out it in a quart glass jar, stirred it up like crazy and covered with muslin cloth. AM- No life yet. Think it was too cold last night to get going. Stirred it vigorously and set it on my toaster oven for the day. I turned it on a few times throughout the day to give the starter some warmth. Stirred it again around noon… there was water floating on top. PM- Still no life. Stirred it up again and left it with a little prayer. AM- Water on top, but see a little life (bubbles). Instead of removing 1/2 of the starter like the instruction says… I added 1/2 cup flour and 1/2 cup water. Stirred it crazily and covered with cloth. PM- Still seeing a separation of water and wheat. Seeing a little more life (bubbles). Stirred it, scooped out half the starter, fed it and stirred it again. Left it covered with muslin cloth as usual. AM- Still seeing the water floating. Still see life, but not much more than yesterday. Stirred, scooped out half, added more flour and water, stirred it like a crazy woman and said another prayer! AM- Yeaaa! Seeing a rise in activity (more bubbles) and the starter has grown! Still seeing water floating in the middle of the wet dough (why is it doing that?! ), not floating on top. Scooped out half the starter, fed it and stirred it up for the day. PM- Seeing more bubbles, but not enough to satisfy me. Decided to give it a strong stir and leave it for the night. No scooping out 1/2 or feeding it. Said another prayer and went to bed. AM- The starter seems to be rising, but there is a layer of water near the bottom (again). Gave it a crazy stir, scooped out half, fed it and stirred it again. To help the starter along, I put it in my dehydrator and left it on low. Noon- Checked the starter and was THRILLED to see that is has doubled its size with LOTS of bubbles! Woohoo! PM- No water at the bottom. Good activity! Stirred, scooped out half, fed it and stirred it again. Said a prayer of thanks and went to bed. AM- Starting to look stronger and consistent with bubbles. No water at the bottom. Stirred, scooped out half, fed it and stirred it like crazy. I put it back in the dehydrator for the day. PM- Same as this morning (AM), but did not put it back in the dehydrator. AM & PM- Showing lots of bubbles and life. Didn’t rise as much as it did yesterday. Did the usual and kept it out in room temperature. AM & PM- Same as yesterday. AM- Starting to look a little flat. Did the usual with a little extra flour and warm water. PM- Rose beautifully and smells slightly sour. So HAPPY! Did the usual and went to bed. AM- Getting more consistent and strong. Did the usual and showed my friend how to care for it over the weekend while my hubby and I went to a missionary retreat. PM- Came home and found my starter dry & dead. My friend kept adding flour, but forgot to add water!! LOL! Thankfully she faithfully scooped out the starter and stored it in another glass bowl to give to the chickens… but decided to wait till I got home. Whew! I was able to use the “discarded” starter to keep going. I simply poured what I needed into a new jar, fed it, stirred like crazy and went to bed. Woohoo! Alive and strong! So many bubbles. Whew! Anyway, in the e-Course they have transcripts of interviewing three cooks (Wardee, Erin and Katie from Kitchen Stewardship) who all have VERY different styles and methods of caring for their sourdough. I found that really helpful and encouraging. One thing I learned is that there is no “set way” of creating your sourdough starter and caring for it… Wardee feeds her starter once a week, does big batches of sourdough cooking once a week and uses fresh flour. Erin leaves her starter out on the counter, uses it everyday and uses store-bought flour. Katie is random and doesn’t have a schedule with her starter, uses both fresh and store-bought flours and she still gets great results! Shows that yeast will thrive if you give it a good environment and time! Katie- are you using the filtered water in the kitchen? If I remember right… they are using a RO to filtered the water… maybe you should add a little unrefined sea salt when you feed your starter. So cool! I can’t wait to see what you make with it! Fun to see the progress! I just pulled a loaf of sourdough out of the oven a couple of minutes ago.